Is your youth athlete at risk? I'm going to take some time to discuss something that I had been peripherally aware of up until I watched the documentary titled "Head Games" (available now on Netflix) about athletes and Chronic Traumatic Encephalopathy (CTE). CTE is a progressive, degenerative brain disease that you and your child cannot afford to ignore. Previously known as Dementia Puglistica (DP), the disease was originally diagnosed in those involved in boxing and is caused by repeated blows to the head. This includes concussive and sub-concussive events. Meaning, whether or not you or your child has ever been diagnosed with a concussion, you may be at risk for CTE. Have your or your child ever been involved in a collision and reported seeing stars? Have you or your child ever been hit in the head and blacked out? Have you ever said things got "fuzzy" after a collision? If so, you have suffered a concussive or sub-concussive event. Depending on the sport, the risk and frequency of suffering blows to the head can increase exponentially. Today, athletes in contact sports such as football, hockey, lacrosse, MMA, boxing, and, yes, even soccer, are reporting more and more concussions. Are they happening more often? Probably not. What seems to be happening is that the awareness regarding CTE by the sports organizers and the general public is increasing after a number of very high profile elite athletes committed suicide and/or murder in what seemed at first like random events. Scientists, however, have diagnosed many of these athletes, including NFL legend Junior Seau, with CTE after autopsy - and it's not just long-time NFL veterans who are suffering. Scientists, researchers and player safety advocates are trying to raise awareness that the damage done to our children during their first 10 years in their sport is putting them at risk for CTE and related brain disease later in life. Did you know that the only football league in this country to limit full-contact practices is the NFL? Here we have a thousand elite athletes, in prime physical condition, and they're only allowed to hit one another once a week (not including game day). Yet, we suit up our 8 year olds in helmets that are too heavy for their underdeveloped neck musculature 4-5 times a week for full-contact practices? Concussions are bad, we all know that. What many people don't know is that all of those seemingly small hits our kids take to the head every day in practice are adding up and youth athletes, in general, are more vulnerable to the effects. It's being reported that sub-concussive hits may be as damaging as diagnosed concussions, and football players are not the only athletes at risk. 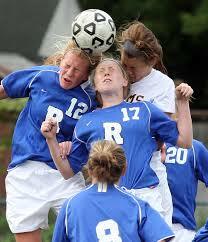 Girls' soccer players, in fact, are reporting more and more concussive and sub-concussive events. "The American Journal of Sports Medicine studied the rate of concussions in high school athletics from 2008 through 2010...Of the 1,936 reported concussions during the study, 47 percent were suffered playing or practicing football. No. 2 on the list: girls soccer, at 8.2 percent." So what do we, as parents, do? Do we stop our kids from playing the sports they love or is there a way to make their play safer? Advocates are working hard to introduce legislation that will help better protect our youth athletes and, according to this article, every state but one has already enacted bills to help get kids off the field at the first sign of head trauma and prevent them from returning to play until they have fully recovered. Yet, like all legislation, the actual implementation and enforcement may not be consistent. As parents and care givers, it it our responsibility to be in tune with our children and speak out for their safety and protection. I know it's hard to tell your kids they can't go back into the game, but it's not the parent's job to always be liked. It's our job to protect first. If you see your child suffer a blow to the head or if they are involved in any kind of collision and are slow to get up or just don't seem themselves - TAKE THEM OUT. I don't care what the coach or other parents say. This is YOUR child/children we are talking about. If your child is complaining of chronic headaches or suffering mood swings, inability to fall asleep or even cognitive/memory problems, remove them from play and have them checked out by a neurologist. Researchers are still learning about CTE and have yet to find a cure or treatments at this time. Your best defense is through prevention. Kids will get knocked around - and that's the name of the game, so to speak. But allowing them to return to play before they are ready can cause irreparable, irreversible damage. *Please take the time to explore the linked articles. CTE is a serious disease that can be prevented through awareness.